Daily Illuminator: SJ Games At The GTS Business Conference! September 24, 2017: SJ Games At The GTS Business Conference! We've had the pleasure of attending the GTS Business Conference this weekend, and it's been a blast! Not only have Phil and I shown a ton of folks the Munchkin Collectible Card Game, but we've recorded with amazing content creators like GameWire, Watch It Played, and Man vs Meeple. And GTS knows how to put on a show, with an entire host of events, as well as a fun trip to the bowling alley. We've learned quite a bit about the folks out there selling our games, and hopefully, they've learned a lot about our new and upcoming releases. 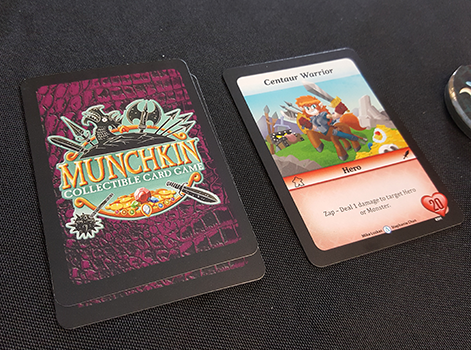 Look for some videos about the Munchkin Collectible Card Game in the near future, or just follow us on Facebook and Twitter; we'll share them there when they come out! Now to try some of this St. Louis pizza I keep hearing about . . .